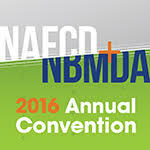 The North American Association of Floor Covering Distributors (NAFCD) and North American Building Material Distribution Association (NBMDA) unite the top distributors, manufacturers, and service providers from the floor covering, specialty building material, cabinetry, and woodworking industries to network, engage, learn, and grow their businesses. This is the most anticipated and highly valued distribution-focused event of the year for suppliers to gain valuable access and deepen relationships with their distributor customers. Manufacturers and distributors set appointments with each other and use this time to form their operating and logistics plans, establish credit, and cover the critical factors that establish and strengthen their partnerships.